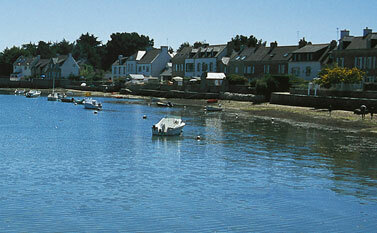 To an expatriot Scot, a visit to Brittany is almost a homecoming. Parts of the glorious coastline are achingly reminiscent of the golden sands and rocky coves where I played as a child. The architecture, too, is sometimes strangely familiar: solitary stone-built houses on heathery moors, and whitewashed fishermen’s cottages laced with spray. Then there is the Celtic culture – a rich tapestry of legend and folklore, traditional music and exuberant dance. The Bretons are deeply proud of their heritage: countless festivals resound to the strains of the biniou-bombarde (the Breton equivalent of bagpipes and chanter) or the full blown bagad (pipe band). It is almost a homecoming, but not quite, and there is plenty to remind me that I am many miles from home. Hobbit-sized chapels, lichen-covered wayside crosses and religious processions, called pardons, reflect centuries of devout Catholic faith. Thousands of megaliths are a remarkable legacy of even more ancient times. There are sleepy rural villages, each with its own café and boulangerie where you can buy freshly baked-baguettes and flaky croissants; and handsome mediaeval towns with cobbled streets, half-timbered houses and flowers on every windowsill. 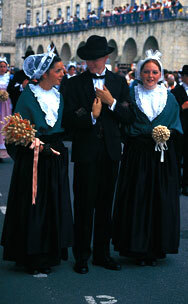 The Breton costumes, too, are unique as we discovered on a visit to the Cornouaille Festival in the south-western town of Quimper. The nine-day bonanza concluded with a magnificent procession, when hundreds of people, young and old, paraded through the streets accompanied by a succession of bagads. The women’s lacy white coiffes ranged from tall, starched bigoudens (tall hats) to simple bonnets, each reflecting a different community, social class or occasion. The men’s sombre black suits were offset by the rich colours of their embroidered waistcoats. In the preceding week we enjoyed a feast of Breton culture and the occasional contribution of visiting Celtic cousins. We sipped cider in a café overlooking the soaring twin spires of Saint Corentin Cathedral while young fiddlers from Dingwall entertained us with jigs and reels. We strolled through the old town after dark to see demonstrations of spinning, embroidery, rope-making and other crafts from days gone by. We listened to drums and flutes and swayed to the rhythm of sea shanties. We looked on as revellers linked hands to form long chains of dancers, hopping and skipping in a bewildering series of circles. When we thought we had got the hang of it, we even ventured to join in.